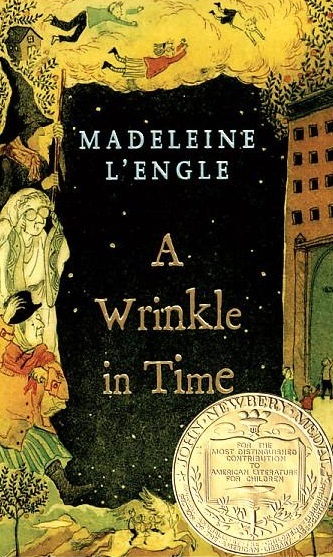 There are heavy doses of both religion and science in the plot, yet author Madeleine L’Engle manages to make them peaceably co-exist. I kept thinking of the book’s likely literary influences, pre- and post-publication. Before: The Wonderful Wizard of Oz, Invasion of the Body Snatchers. After: the Harry Potter books. 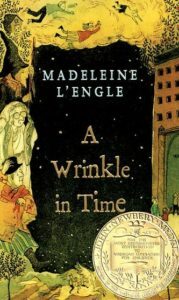 J.K. Rowling is the more entertaining, skilled writer, with stronger characters; L’Engle deals more overtly with adult themes. I’m guessing that Wrinkle was (is?) more popular with girls than with boys. I mean, any story that ends with the heroine conquering evil by (spoiler alert!) declaring “I love you!” to her baby brother is going to be a tough sell to the mud-and-trucks crowd.